What it’s about: If you believe today’s sinister conspiracy theorists, the government is in the thrall of a “deep state,” a shadowy cabal of career bureaucrats who do sinister things like give the government continuity through Democratic and Republican administrations and handle the basic administrative tasks that keep the country going. Before our embarrassing current era, conspiracy theories about the government used to be a lot sexier, like the story that first appeared in 1955 about a successful WWII-era effort to render a Navy destroyer invisible. Biggest controversy: Like most great conspiracy theories, it’s completely false, but has a tenuous connection to the truth. No destroyer ever became invisible, but the Philadelphia Naval Shipyard had conducted experiments on degaussing (i.e., eliminating a magnetic field), which would make a ship undetectable (nay, invisible) to magnetic mines. So that may have been the origin of the story, but the similarities to reality end there. The experiment was supposedly conducted by the Office Of Naval Research on October 28, 1943, using the USS Eldridge. But the ONR was established in 1946, and the Eldridge was in port in New York until September of 1943, when it departed for the Bahamas. 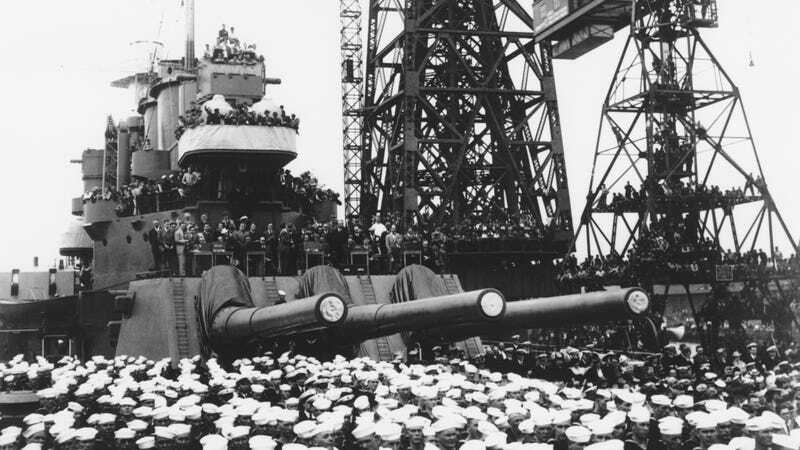 Veterans who had served on the ship affirmed the Eldridge had never actually been to Philadelphia. Just what someone who took part in a secret experiment in Philadelphia would say. Strangest fact: Unlike most urban myths, which seem to bubble up from the collective unconscious, the Philadelphia story seems to have come from one particular guy. UFOlogist Morris K. Jessup received two letters in 1955 from one Carlos Miguel Allende, who claimed to have witnessed the secret experiment. But in Allende’s version, the Eldridge became invisible, teleported to New York and then to another dimension, met aliens, then traveled through time. In the process, several sailors were “fused with the ship’s hull” and killed. Jessup—a man credulous enough to have written a book on UFOs—dismissed Allende as a crackpot. It didn’t matter. The story was out there, and it persisted. In 1979, Charles Berlitz, who had already written a bestseller on the Bermuda Triangle, wrote The Philadelphia Experiment: Project Invisibility. It essentially collected Allende’s writings into book form, and pushed the experiment into the public consciousness. Five years later, it was loosely adapted into a film (which did not, unlike the book, purport to be based on true events), wherein the ship vanishes permanently and some of the sailors onboard are sent into the present day. Thing we were happiest to learn: The USS Eldridge may have been able to use the next best thing to teleportation. While the claims that the ship teleported to New York are certainly apocryphal, another account has it appearing in Norfolk, Virginia, and that might have actually happened. As German U-boats were attacking American ships up and down the Atlantic coast, the Navy was quietly using canals to move ships from port to port undetected. The Eldridge could have left Philadelphia via the Chesapeake and Delaware Canal and arrived in Norfolk the next day. Best link to elsewhere on Wikipedia: While the Navy never did manage to make a destroyer invisible, they might have done so with an airplane. Around the time of the alleged Philadelphia Experiment, the Navy actually did experiment with camouflaging a plane using Yehudi lights. These lights at the front and sides of an aircraft would brighten it to blend in with the daytime sky until it was close enough to a German submarine to drop a depth charge without alerting the sub’s crew. The technology was tested, but not put into practical use, and postwar radar made the lights obsolete. Further down the Wormhole: While the experiment was just delusional speculation in the ’40s, it’s actually plausible in the futuristic 2010s. The Philadelphia Experiment’s supposed cloaking device used a powerful magnetic field to bend light around the destroyer, inspired by Einstein’s unified field theory, which sought to relate gravity and electromagnetism. Modern-day scientists have been able to do just that, controlling electromagnetic fields in what’s called metamaterial cloaking. “Metamaterials” are engineered to display properties not found in nature, in this case, diverting some frequencies of light around itself. They’re on a long list of futuristic emerging technologies that are passing from the realm of science fiction to outright science. Another is the controversial process of de-extinction. We’ll see how life, uh, finds a way next week.